The Old Caledonian Bed & Breakfast resides in the grand Ruggles-Evans-Dent House, built in 1849 in the quaint Village of Caledonia, Missouri. Listed on the United States Register of Historic Places, the home was built by Elijah Starr Ruggles, son of Martin Ruggles, one of the founders of the Springfield Lead Furnace near Caledonia. Ruggles sold the home to James S. Evans in 1853; the Evans family sold it to W. J. Dent, a banker and relative of Julia Dent Grant, wife of Ulysses S. Grant, in 1911. This beautiful Greek Revival-style mansion still contains original stairways, features, quarters, and woodwork (hewn from walnut trees cut and milled on the property) from when the house was originally built. 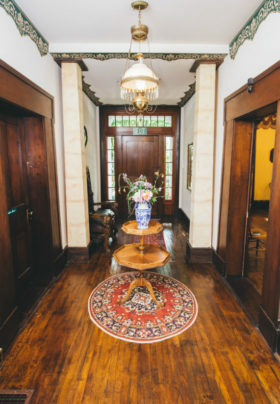 As you enter the Old Caledonian Bed & Breakfast to check in, you will find yourself in the keeping room, which still boasts an enormous and original cooking hearth, as well as country-home finishes and an original mural by the artisans of famed local potters, Chanticleer. As you walk past the kitchen into the main parlor and dining room, you will be awed by the elegance and glory of the walnut arches, the stately furniture, and the graceful ambience. This is where we serve breakfast each morning, hold tea service in the afternoons, and occasionally host special events such as historical lectures, musical performances, and fancy dinners. Be sure to stop and reflect on Caledonia’s history and ancestors by viewing the original photographs of founders and landmarks in the house’s former receiving area. Ascend the antique staircase, with its switchbacks and gentle creaks, to the main guest room area, where each room is named and themed with attention to Caledonia’s tradition and history. The Old Caledonian Bed & Breakfast proudly honors the Scottish heritage of the village’s founders and original settlers, including Penny’s great-great grandparents. Keep your eye open for decor, artwork, and menu items that keep these traditions alive. The four acres of the Old Caledonian Bed & Breakfast’s grounds are a marvelous, quiet retreat from life’s hustle and bustle. Winding pathways gently work their way through the wooded areas along a softly running creek, past wood-hewn benches, and a stone fire pit. Our relaxing gazebo, nestled next to the peaceful koi pond, and the secluded brick patio in the back make for a perfect getaway. Visit the Crabapple Cabin, an antique and craft shop we have on the property – or simply walk across the street to experience the charm, food, history, and friendliness that the Village of Caledonia has to offer. The Old Caledonian Bed & Breakfast and our fantastic grounds are also available for incredible weddings and events. Please refer to our Weddings and Events page for more information. Husband-and-wife team Penny Province and Jon Emanuel are your welcoming hosts at the Old Caledonian Bed & Breakfast. 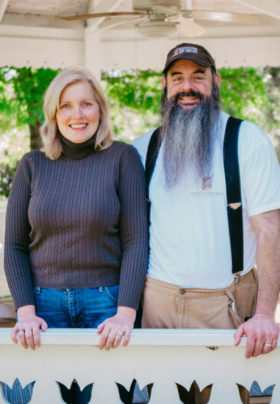 With over three decades of combined inn-keeping, culinary, and hospitality experience, Penny and Jon can’t wait to share the Old Caledonian Bed & Breakfast with you. Penny’s family history in Caledonia and the surrounding areas can be traced back over a century and a half. 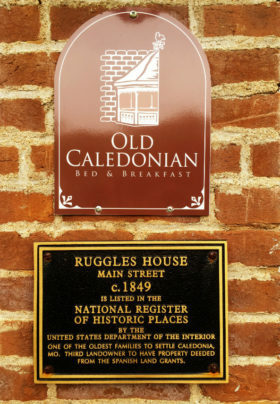 Penny’s great-great grandparents, Columbus and Caroline Bean, were among Caledonia’s earliest Scottish settlers, and their original portraits adorn the Old Caledonian Bed & Breakfast’s parlor area. Penny grew up in nearby Flat River, MO, but much of the time she could be found at her grandparents’ farm, just a mile or so down the road from the Old Caledonian Bed & Breakfast. Montgomery Farm is still owned and operated by Penny and her family. Penny was the owner/innkeeper of the beautiful and acclaimed Schoolhouse Bed & Breakfast in Rocheport, MO for a decade. Her background in home staging is evident in her beautiful decorative touches at the Old Caledonian Bed & Breakfast; and her time as an etiquette educator might have some influence on her graceful approach to hosting our guests! It was Penny’s spirit of gracious hospitality and love for the Village of Caledonia that inspired her to open the Old Caledonian Bed & Breakfast. Jon has been a professional chef for 25 years. Trained at the California Culinary Academy, Jon’s experience has taken him around the world. His first Executive Chef position was at the incredible Glacier Bay Country Inn, located in the wilds of bush Alaska. His next turn as Executive Chef was at South Pole Station, Antarctica, to which he made seven deployments over six years to feed scientists and support crews at one of the planet’s most challenging locations (oh, the stories Jon can tell you!). Jon spent his most recent Executive Chef position providing nutritious, potentially life-saving meals to thousands living with life-threatening illnesses at Project Angel Heart, a non-profit in Denver, Colorado. Jon also taught culinary arts as a Chef Instructor at the Metropolitan State University of Denver for several years, as well as butchery at the Rocky Mountain Institute of Meat. Over the span of his career, Jon’s work as a chef has received mention and praise in Food & Wine, Saveur, the Denver Post, and the New York Times. He has also made several national and local television/radio appearances, including features for PBS, ESPN, NPR and National Geographic TV, as well as dozens of cooking demos on local TV. Jon’s passion for great food, love of community, and fondness for meeting new friends inspired him to open the Old Caledonian Bed & Breakfast with the love of his life, Penny. Penny and Jon met at an inn-keepers’ convention in Hilton Head, South Carolina in 2000. After a long-distance romance between Missouri and Alaska, they both settled in Denver after Jon’s promotion at the United States Antarctic Program in 2002. They married in 2003 on the island of Kauai, Hawai’i. For years, they worked to move back to Caledonia, finally opening the Old Caledonian Bed & Breakfast in 2016. They are thrilled to share their home, their Village of Caledonia, and their hospitality with you!